Underride guards are safety equipment that can be added to tractor trailers and other large, commercial trucks to protect drivers of passenger vehicles from fatal injuries. These pieces of equipment can keep a vehicle that collides with the side or back of semi-truck from going under the truck, thus turning a fatal crash into something more akin to a rear-end crash. An article in Forbes called underride guards “a kind of metal bumper that hangs from the back of a high-riding semi to stop a smaller vehicle from sliding underneath in a rear-end crash.” Unfortunately, it is not just your car that is may get completely run over. Without side and rear underride guards, the driver and front seat passenger are likely to be crushed and killed if their vehicle ends up in an accident with a large truck. An underride guard is a large, metal panel that acts as a bumper attached to the rear and the side of 18-wheelers to prevent smaller, passenger vehicles from slipping under the truck in a crash. In the spring of 2017, the Insurance Institute for Highway Safety (IIHS) conducted crash tests to show how side underride guards can help to prevent side underride crashes, and the tests showed that side underride guards can potentially save lives. The video “Car vs. Truck” shows the astonishing 2017 IIHS crash test results. The video portrays the results of the side-impact of a sedan traveling 35-mph with a tractor trailer. The first crash shows a passenger vehicle crashing into the side of the truck that has been equipped with a fiberglass side-skirt, which is designed to improve the truck’s aerodynamics. The sedan slides under the side of the truck, crushing the front end of the car and then crushing the passenger compartment as the driver and front seat occupants come into contact with the side of the truck. The test with the AngelWing side underride guard device attached shows how the guard causes the sedan to bounce back after striking it and the vehicles airbags deploy further cushioning the impact on the driver. The video shows how having side underride guards installed can help prevent the gruesome deaths that can occur without them making side crashes with large trucks more survivable. IIHS data estimates that about 750 people were killed in underride crashes in 2015, and they are recommending that the federal government require truck manufacturers to add side guards to their trucks to save lives. David Zuby, IIHS vice president said, “Our tests and research show that side under-ride guards have the potential to save lives. 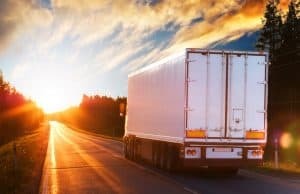 We think a mandate for side under-ride guards on large trucks has merit, especially as crash deaths continue to rise on our roads.” An IIHS study found that side underride guards could help reduce the risk of injury in about 90% of side impact crashes between smaller, passenger vehicles and large trucks. Our compassionate Phoenix truck accident attorneys fight for you as you seek justice in the form of fair compensation when you have been hurt in a truck crash. We offer free consultations where you can discuss your case with an experienced Arizona truck accident attorney. We invite you to call Plattner & Verderame, P.C. now at 602-783-8793, or fill out our contact form.